"An elephant never forgets." 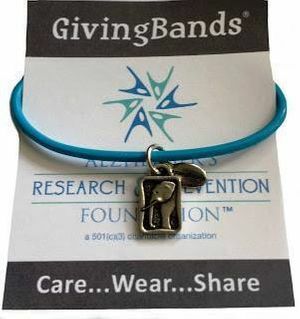 ARPF has developed a "Memory Band" with the charm of an elephant to help remind us of the kind of mind we can have - a sharp mind that we can keep that way as long as we follow the 4 Pillars of Prevention. This is a fun reminder you can not only prevent or delay Alzheimer's disease, but help eradicate it as well. Join us in our mission by purchasing a memory band for yourself and those you love. Price includes S&H in the US.A. Price: $25 includes S&H in the USA.